Pilates takes its name from Mr Joseph Pilates. A German-born who migrated to Britain and then America, he devised the Pilates method as a new approach to exercise and body-conditioning in the early decades of the last century. His method included the use of equipment referred to by him as: apparatus. Perhaps the best-known piece of equipment, is the Pilates reformer, which is in use in the 4Lane studio today. 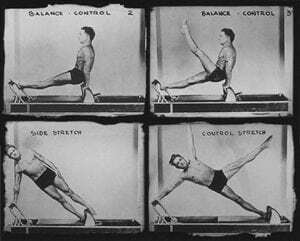 Joseph Pilates was born near Dusseldorf in 1880. He was a sickly child who was determined to make himself strong and healthy. He took up body-building, to the point where by his teens he was getting work as a model for anatomical drawings. In 1912, aged 32, he left Germany for England, where he became a professional boxer. An expert skier and diver, it was in England that he taught self-defence to Scotland Yard detectives and found work as a circus acrobat. On the outbreak of World War I, the British interned him as a German enemy alien. He used his time as an internee to start developing a new approach to exercise and body-conditioning – the start of what is known today as Pilates. During his internment, he also got the chance to work as a nurse. This, in turn, gave him the chance to experiment by attaching springs to hospital beds, so that patients could start toning their muscles even while they were still bed-bound. Such were the origins of the first Pilates machines now known as the Pilates reformer. In their early incarnation the Pilates reformer was shaped like a sliding bed and used springs as resistance. Returning to Germany after World War I, Pilates worked with pioneers of movement technique such as Rudolph Laban. It was Laban who created the basic system of dance notation still used today. In 1923, Pilates moved to America. He opened his first studio in New York along with Clara, his wife and assistant, whom he had met on the Atlantic crossing. His new method was an instant hit, particularly among dancers such as Martha Graham and George Balanchine. Other dancers also became devotees. They found the Pilates method the best way both to recover from injuries and to prevent their recurrence. Gradually, a wider audience got to hear of it the method. Pilates called his technique ‘Controlology’ – only later did it become known by his own surname. He conceived it as a mental as well as a physical conditioning in which individuals could work their bodies to their full potential. Learn more about our Pilates classes in Dunsborough.